Halloween is right around the corner! That means trick or treating with your family, costume parties, pranks and of course, ghost stories! If you’re ready to be scared stiff, here are 3 of the best self-storage ghost stories we found on the internet. A business storage facility in Baton Rouge used to be a hospital and a morgue. 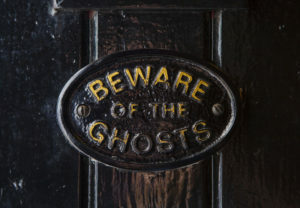 Spooky goings-on include the lifts going up and down on their own, unusual sounds and unexplained drops in temperature where the old morgue freezer used to be. Building security guards try to avoid going to the ground floor at night, as this is when most of the occurrences happen. Among the most famous haunted self-storage facilities is Armadillo Self Storage in Sheffield, England. The facility is built on an old cinema and during renovations, a pair of electricians reported they saw the ghost of Mr. Porter, a longtime theater attendant, walk into the bathroom. When one of the electricians followed him into the bathroom to tell him the area was off-limits, the bathroom was empty. Armadillo employees have also reported seeing flashing projector lights and have heard the projector running. Staff also reported seeing flashing white lights coming from the old projector room, even though the room was empty and had been burned in an accidental fire. When an old apprentice of Mr. Porter’s was invited to the building, he noticed the floor was vibrating and asked if the projectors were running. Told the room was empty, he insisted on looking inside. When the group stood outside the door, they could reportedly hear the projector running. As soon as they opened the door, the noise stopped. An employee at a self-storage facility in Oakland, CA was convinced the third floor of her facility was haunted after hearing strange noises. One night, the alarm went off on the third floor, but after investigating, the worker found nothing but an empty hallway. On checking the surveillance footage, the worker was shocked to see a bright flash followed by a blank screen at the exact moment the alarm went off. This was followed by another bright flash and the screen returning to normal that showed the worker emerging from the elevator. Don’t let these stories of self-storage ghouls and ghosts scare you too much! And remember, if you need a place to store all of your Halloween tricks and treats, call STORExpress!